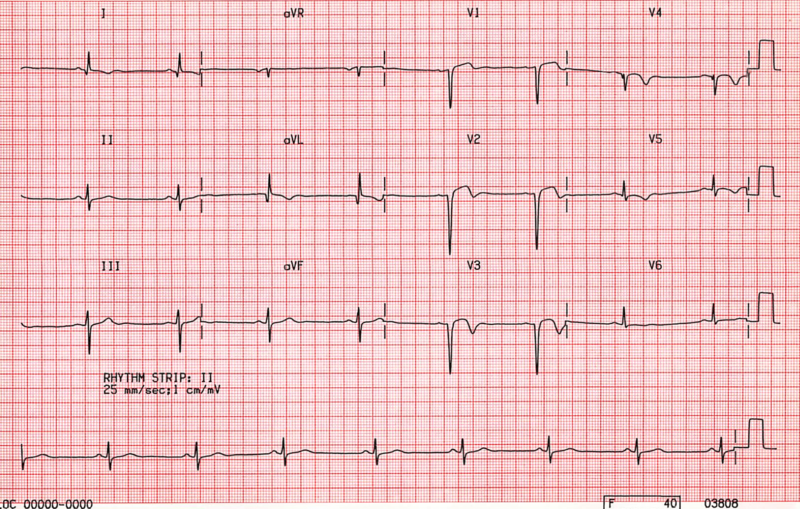 The ECG was recorded from a 60 year old man taking beta blockers for angina following myocardial infarction. Rhythm: Sinus rhythm is present at a rate of 50 per minute. The rhythm is sinus because P waves of normal morphology are present in front of each QRS complex. P wave morphology is constant in any one EGG lead and each P wave is followed by a QRS complex. The PR interval is constant and of normal duration (it lies between .12 and .21 seconds). By definition bradycardia is present as the rate is less than 60 per minute. The rhythm is therefore sinus bradycardia. Morphology: The EGG also shows the effects of anterolateral infarction. Pathological Q waves are present in leads I, aVL and leads V2, V3, and V4. There is loss of R wave in the anterior precordial leads. T wave inversion is also present in leads I, aVL and V2-V5 and the T wave is flat in V6. treatment with beta blockers. This arrhythmia may be seen with other drugs that depress sinus node function and in sino atrial disease. It is a common resting rhythm in atheletes. Other causes include hypothermia, myxoedema and the increased parasympathetic tone that may occur in severe pain – especially following myocardial infarction.